I never laughed harder than that night alone. You were in the old hotel in Miltown Malbay. in any sense as faithfully as then. who lived as a she. to a ship heading for the country where they edit the best films. from the portholes on board. The ship would transport us first to Iona and the monastery. in every harbor we entered. 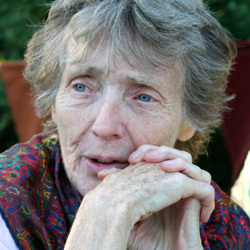 Fanny Howe is the author of more than forty books of poetry and prose, most recently Come and See (2011), The Lyrics (2007), Radical Love (2006), On the Ground (2004), Gone (2003), Economics (2002), and Selected Poems (winner of the 2001 Lenore Marshall Poetry Prize). In 2009, she won the Ruth Lilly Poetry Prize, presented each year by the Poetry Foundation to a living U.S. poet deserving of extraordinary recognition for a lifetime of literary work. She has also received awards from the National Endowment for the Arts, the National Poetry Foundation, the California Arts Council, and the Village Voice, as well as fellowships from the Bunting Institute and the MacDowell Colony.